I've been in a festive Fourth of July mood this entire week. I keep unconsciously reaching for stripes and anything red, white, and blue. While I enjoy dressing to a theme, I try to avoid cliche outfits (say, flag bikinis and star spangled shorts!) - not that there is anything wrong with that, I just prefer subtly embracing the occasion! I think it's fun to at least look like I didn't put too much thought into an outfit (even if most of the time it's hardly the case)! 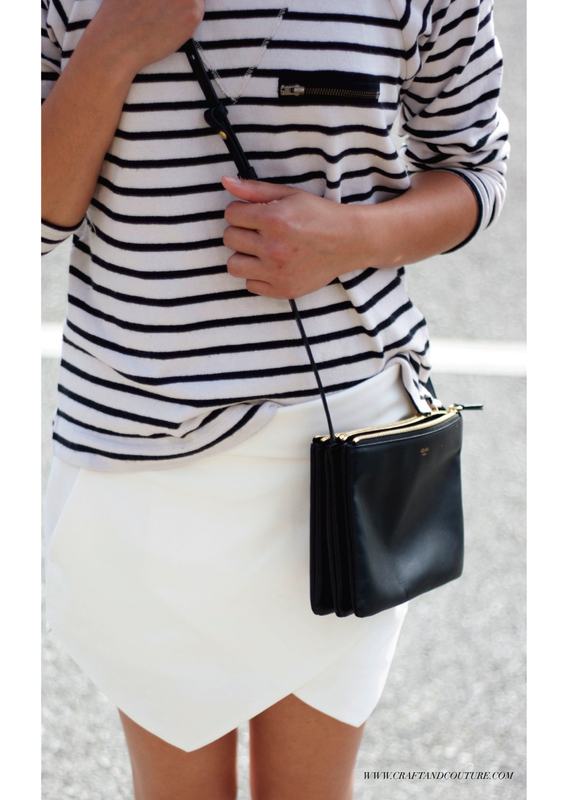 These Zara wrap skorts have been a summer staple in my closet (I have it in two colors). They are my happy medium between a skirt and pants (my choice of bottoms). Yes, they are everywhere these days - but I love them! Can't believe I got white though. It's so hard to keep anything clean when you have kids. What compelled me is the fact I actually have a tan from all the fun in the sun we've been having! The sandals are by Bronx - they have a minimalist vibe, very Celine. Great quality, and such a good price!